Published: Oct. 4, 2016 at 11:47 a.m. Updated: Oct. 4, 2016 at 12:20 p.m.
TAMPA, Fla. -- There comes a point when you have to accept that certain teams are just too good to count out, regardless of the circumstances. The New England Patriots have proved as much under head coach Bill Belichick. The Denver Broncos are now doing the same with their head coach, Gary Kubiak. The more the reigning Super Bowl champions keep playing, the harder it is to imagine them eventually failing. That mental toughness was on display once again when the Broncos faced the Buccaneers in Tampa on Sunday afternoon. This didn't seem like much of a game until Denver lost starting quarterback Trevor Siemian to a shoulder injury on his left (non-throwing) shoulder late in the second quarter. Suddenly the Broncos, leading 14-7 at the time of the injury, were forced to rely on untested rookie Paxton Lynch for the entire second half. 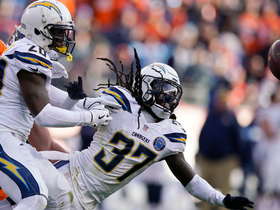 All that dilemma did was give their defense more motivation to take over and the remainder of the Broncos ample reason to elevate their own performances. The final score -- 27-7 in favor of Denver -- won't tell the full story of what happened inside Raymond James Stadium that day. This was one more substantial piece of evidence that the Broncos, now 4-0, should be considered early front-runners to hoist another Lombardi Trophy. "It's been a good month," Kubiak said. "We divide [the season] into quarters and it's obviously been a good first quarter. There are so many things we can work on as a team, which is what I'm excited about. We've got some injuries to work through and we have another one today. But we keep stepping to the plate, playing hard and playing well late, which is what you have to do to win in this league." The best thing about the Broncos right now is their unwavering confidence. When quarterback Brock Osweiler bolted to Houston in free agency, Siemian emerged as a viable replacement after winning a three-man quarterback competition throughout the offseason. When key defensive players like defensive tackle Malik Jackson and linebacker Danny Trevathan also signed with other teams, the Broncos simply plugged in new players and kept plugging away. Then Siemian goes down on Sunday and Lynch does just enough to help them win, including throwing the first touchdown pass of his NFL career. This is what great teams do. They don't worry about the circumstances. They focus on solutions. The Broncos might have been perilously close to not even making the playoffs last season -- which is easy to forget in the wake of their Super Bowl win -- but they've been on fire ever since January. At this point, it's hard to not wonder what or who actually is going to slow them down. A lot of that optimism comes back to an elite defense that nobody has been able to figure out this season. Denver is allowing just 16 points per game and the D ranks among the league leaders in both total yards (fourth in the NFL) and passing yards allowed (second). 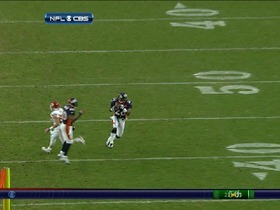 Even a broken forearm to Pro Bowl outside linebacker DeMarcus Ware hasn't hurt the overall effectiveness of this unit. 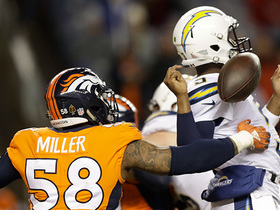 That's mainly because his Pro Bowl counterpart, outside linebacker Von Miller, is terrorizing quarterbacks every time he steps onto a football field (see: 5.5 sacks in four games this season). But also, what makes this defense so dangerous is that it seems to find a new hero each week. In a 29-17 win at Cincinnati two weeks ago, second-year outside linebacker Shane Ray tallied three sacks. 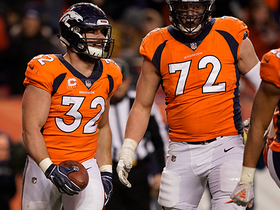 This past weekend, it was defensive end Derek Wolfe picking up 2.5 sacks of his own, and Pro Bowl cornerback Aqib Talib intercepting two passes as he faced the team that drafted him into the NFL. It's reached the point that the Broncos are starting to see teams try all sorts of tactics to keep them off-balance, none of which seem to be working. "The last couple weeks, we definitely got different looks from the opposing offenses," Talib said. "Tampa came out and did everything opposite from what we saw on film. Cincinnati came out and ran the ball a lot against us [even though the Bengals have been one of the worst rushing teams in the league this season]. We've seen different things, but we also expect that stuff." Denver clearly expects its quarterbacks to deliver when called upon, as well. Siemian has been a revelation thus far, as he was the least recognizable of the three signal callers competing for the starting job after Osweiler's departure. (The Broncos traded for Mark Sanchez, who is now in Dallas, and selected Lynch in the first round of this year's draft.) Siemian has shown a little more of his game with each passing week and his breakout moment came against Cincinnati (312 yards and four touchdown passes). In fact, it's already fair to say he can be more than just a game manager for this team. It's also not a leap to think Kubiak can't maximize Lynch's talents if the rookie has to play against Atlanta this coming Sunday. Doctors ruled Siemian's injury as a sprained shoulder -- and he said he could've returned to the game if necessary -- but Lynch displayed enough comfort to think he could handle more time if it comes to that. Kubiak called plays in way that allowed the rookie to find a decent rhythm. In the end, Lynch completed 14 of 24 passes for 170 yards and one touchdown, which was more than enough to help Denver secure a road victory. This isn't to say that life won't become tougher for the Broncos as this season moves forward. There are bound to be more injuries, along with other unforeseeable setbacks down the road. It's just that this team really isn't fazed by any challenge that lands right smack in front of it. These Broncos seem to savor the opportunity to prove that last season's championship run wasn't solely about a team that got hot at exactly the right time. So it will be interesting to see what the Broncos are capable of doing next. They've already established themselves as the team to beat once again in the AFC West and they've shown us all that it doesn't matter who they put under center. The real question then has to be if there's a reason to think this team can't turn this momentum into back-to-back championship seasons. At the rate they're going, it would be crazy to bet against that actually happening.